What Is an MDT File? A file with the MDT file extension is a Microsoft Access Add-in Data file, used by Access and its add-ins for storing relevant data. Although Microsoft Access uses both file types, an MDT file shouldn't be confused with the MDB format that Access uses to store database information, unless your particular MDT file happens to be an old Microsoft Access 97 template file. An MDT file may instead be a GeoMedia Access Database Template file, which is a format used by the GeoMedia geospatial processing software to create an MDB file out of its data. Some video editing software may use the MDT file extension, too, to store text in the XML format about the video creation process. This may or may not be related to the MDT video format used by some Panasonic cameras. Autodesk's (now discontinued) Mechanical Desktop (MDT) software uses this abbreviation as well, but I don't think its files are saved with the .MDT extension. MDT files also have nothing to do with the Microsoft Deployment Toolkit (MDT) used for installing the Windows operating system. 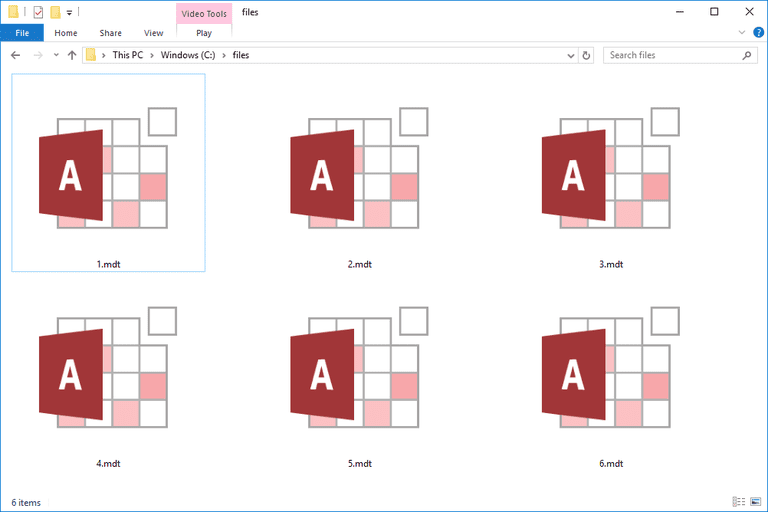 Microsoft Access opens files that are in the MDT format. If your MDT file isn't a Microsoft Access Data file, then it's most likely used by Hexagon's GeoMedia Smart Client. A simple text editor should be able to open MDT files that are produced from video converters or video editors. You probably only need to open this kind of MDT file if you're not sure where the program is storing the video file, since the location of the video is stored in the MDT file. See our Best Free Text Editors list for some good options for viewing these types of MDT text files. If your MDT file is associated with a Panasonic camera and it's corrupted and not able to be used normally, see this YouTube video on how to repair the MDT file with the Grau Video Repair Tool. A text editor might be useful even if your MDT file isn't saved in any of these formats. Just open the file there and see if there's any header information or readable text anywhere throughout the file that indicates what program was used to create it. This can help you research software that supports opening that specific file. If you find that an application on your PC does try to open the MDT file but it's the wrong application or if you would rather have another installed program open them, see our How to Change the Default Program for a Specific File Extension guide for making that change in Windows. An MDT file probably can't be converted into another format that Microsoft Access recognizes. This type of data file is likely just used by the program when the data is needed, and not intended to be opened at will, like with ACCDB and other Access files. It's likely that GeoMedia Smart Client can export its data into other formats in addition to MDT, so I assume you can use the same program to open the MDT and save it to a different format. I see no reason to convert an XML-based MDT file, but you certainly can if you want to. Just open the file in a text editor and then save it to a new format like TXT or HTML. Before assuming that the programs from above are not working correctly to open your MDT file, you might consider whether you're reading the file extension correctly. It can be easy to confuse one file format with another if they use similar file extensions. For example, the MTD suffix looks a lot like MDT but is actually used for Musicnotes Digital Sheet Music files, a format that does not work with any of the MDT file openers above. The same could be said for MDF, MDL, and DMT files, all of which are used for unique file formats that open with specific, and different, software programs.